The Dremel 8220 variable-speed cordless rotary tool kit gives you a powerful tool that exceeds the performance and versatility of all other Dremel cordless rotary tools. The strength of its motor facilitates maximum performance at all speeds. The ability to use all current Dremel rotary tool accessories and attachments allows you to use the Dremel 8220 to complete a wide range of projects. A slim ergonomic body provides a 360-degree grip zone for control in any position. Powered by 12VMAX lithium-ion battery technology, the Dremel 8220 has a 33% longer run-time than the Dremel 8200 tool when cutting screws. 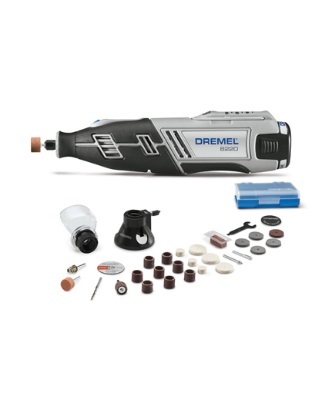 Dremel 8220 rotary tool kits include dozens of accessories and a micro case for easy storage.